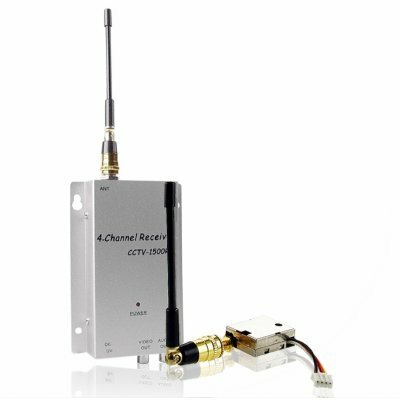 Successfully Added 1.2GHz Wireless Transmitter + Receiver - 80M Range to your Shopping Cart. Mini 1.2GHz wireless transmitter adapter plus 1.2GHz wireless receiver security set for making any RCA wired camera into a long ranged wireless security camera. Imagine the ease of a wireless camera's setup, mixed with the quality that wired cameras can give, and you will begin to see how versatile and excellent this product really can be. With this security wireless transmitting adapter, video and audio will be transmitted up to 80 Meters without any interference, and then all you have to do is plug the wireless receiver into any device with AV IN to see the pictures. A super security set, with great possibilities, and incredibility low wholesale price..
on 2009-12-09 05:29:55 Servcio perfecto como si estubiera aqui al lado! !